The 2015 Homecoming Activities will take place Oct. 8-10. Wayne State College welcomes back all alumni for the 2015 Homecoming activities. Wayne State College will celebrate Homecoming weekend on Oct. 8 with reunions, a parade, award banquets, and football and volleyball games. "A number of Homecoming activities are planned to include the public. Wayne State College has a number of events open to the public for families and individuals to enjoy,'' said Sara Bebee, director of alumni relations at Wayne State College. Royalty Coronation was held in Ramsey Theatre on Monday, Oct. 5, at 8:30 p.m. Matthew Henery and Sarah Warga were crowned the 2015 Homecoming King and Queen. The Wildcat Day Block Party is open to the public on Friday, Oct. 9, from 5 to 7 p.m. Chili and hot dogs will be served (free for students with ID, $6.50 for public) downtown. There will be various booths with carnival games, vendors, and live music. Play games to win prizes. Some prizes will be raffled off at 9:30 p.m. Also on Friday, a Pep Rally will take place at 6:30 p.m. during the block party. Listen to the football coach, cheerleaders, and band, and meet the football players. The public is welcome. The Homecoming street dance will be 7:30 to 10 p.m. Outstanding Alumni Graduates from each of the college's four schools will be honored at the Outstanding Alumni Banquet on Oct. 9 at 5:30 p.m. The 2015 Alumni Service Award will be presented to Adrian (Johnson) Minks ’68 at the Hall of Fame Banquet on Oct. 10 at 5:30 p.m. The award recognizes alumni who have enhanced the college through dedicated service, promotion and financial support. Adrian is a native of Little Sioux, Iowa, and graduated from West Harrison High School, in Mondamin, Iowa. She is a '68 alumna of Wayne State College and has since lived and worked in Omaha. Randy Pedersen of Wayne (Contributor) ‘71: Pedersen graduated from Wayne State College with a degree in business administration. He worked as a financial planner until 1972. Pedersen accepted a position with Zales Jewelers and served as a store manager until 1978 when he purchased a local jewelry store that he renamed The Diamond Center. This business is now The Diamond Center - Flowers & Wine. He has served on the Wayne city council and planning commission, served as past President of the Wayne Area Chamber of Commerce, and served as chairman for the Business Improvement District on the reconstruction of Main Street. A member of WAEDI and the Wayne Rotary Club, Pedersen has been involved in the jewelry industry as past President of the Nebraska, South Dakota Jewelers Association and is on the Board of Directors. He is a member of the Jewelers of America, Jewelers Security Alliance and sits on the Merchandise Review Committee for Retail Jewelers Organization, a buying group of more than 900 independent jewelers across the nation. Pedersen also serves on the Providence Medical Center Board of Trustees and the Little Red Hen Board of Trustees. He received the Wayne State College Alumni Achievement Award in 2007. Pedersen has committed his time and support to Wayne State College as a Cat Club member, corporate sponsor, long-time season ticket holder of Wildcat Athletics, a trustee of the Wayne State Foundation, Executive Committee member and past President of the Wayne State Foundation. 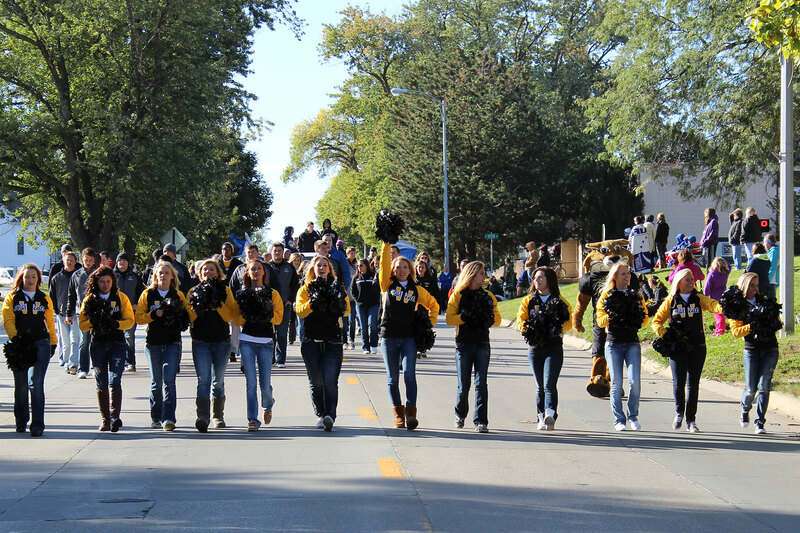 The WSC Homecoming and Band Day Parade starts at 9:30 a.m. on Saturday, Oct. 10, in downtown Wayne at 1st and Main Streets and continues north on Main Street, ending on campus. Please plan to arrive early to stake out the best viewing spots. The Wildcat Tailgate reception on Saturday, Oct. 10, will serve refreshments to alumni for a cost of $10 each, beginning at 11:30 a.m. Royalty will be introduced during halftime of the game at 12:30 p.m. The Wayne State football team will battle Southwest Minnesota State University at 1 p.m., and the volleyball team will face University of Minnesota Crookston in Rice Auditorium on Saturday, Oct. 10, at 4 p.m.
Dr. Todd Young, Wayne State College planetarium director, has announced the regularly scheduled planetarium show for Friday, Oct. 9, will be replaced with a special event with the Department of Music at WSC. The Black Box Trio will present “Under the Stars” featuring WSC faculty Dr. Karl Kolbeck, Kathi Angeroth and Philip Pfaltzgraff. They will perform music in the planetarium for violin, clarinet, and piano on Oct. 8 and 9 at 7:30 p.m.
Additional planetarium shows will include: Flight Adventures on Saturday, Oct. 10, at 2 p.m., and Back to the Moon for Good on Saturday, Oct. 10, at 3 p.m.